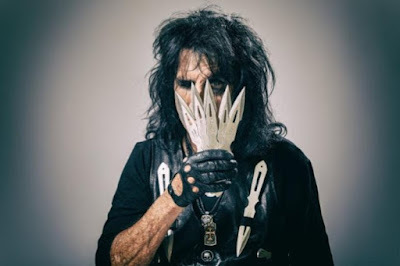 Billed as "A Paranormal Evening With Alice Cooper", the month-long run will begin in Windsor, ON on March 1 and wrap up in Indianapolis, IN on March 29 (see full list of dates below). Cooper’s 27th album, “Paranormal” reunites the rocker with producer Bob Ezrin and includes guest appearances by U2 drummer Larry Mullen Jr., ZZ Top's Billy Gibbons and Deep Purple bassist Roger Glover. Cooper recently premiered a video his next single, “The Sound Of A”, a track whose origins date back 50 years and was rediscovered by the shock-rocker when Dunaway suggested the track during sessions for the project. "So, he brought it in and Bob Ezrin says ‘I love this, we gotta do this song.' In the end, it became the most psychedelic track because during the recording of it, everybody just went off on these guitar parts and it just swirled at the end. It really ended up being one of the most interesting songs on the album - with a great story behind it. I totally forgot that I wrote it!" "The Sound Of A" will be issued February 23; available as a limited-edition CD single and on 10-inch white vinyl, the release also includes four previously unreleased live songs recorded in Columbus, Ohio in 2016.